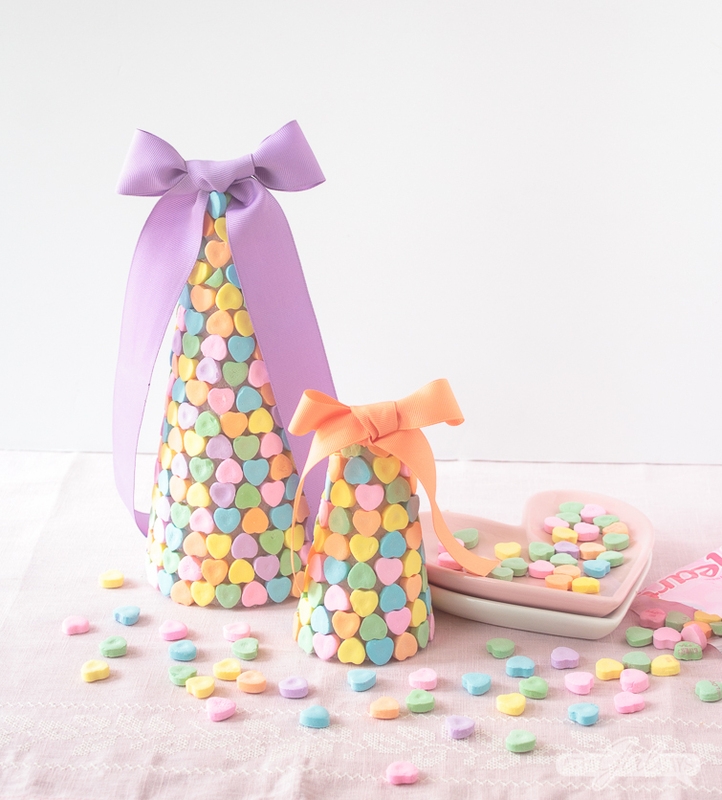 Valentine Candy Heart DIY Centerpieces are just Sweetest! 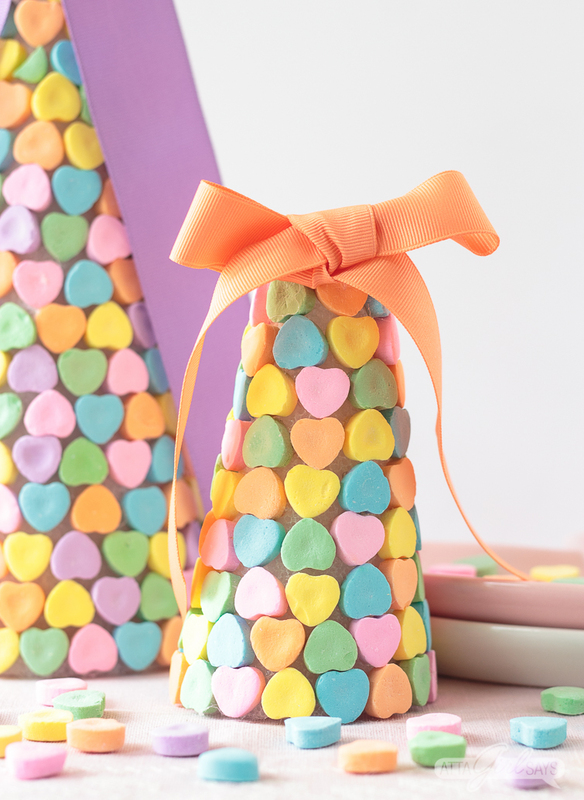 Add a sweet touch to your holiday table with these cute and easy-to-make Valentine candy heart centerpieces made with conversation hearts. For me, it’s not Valentine’s Day without conversation hearts. It’s not that I really love taste of the Valentine candy hearts. But as a kid, I did I always loved reading through the cheesy romantic messages on them and watching them evolve over the years. Be Mine. Kiss Me. Call Me. Fax Me. Page Me. #Love. TXT Me. 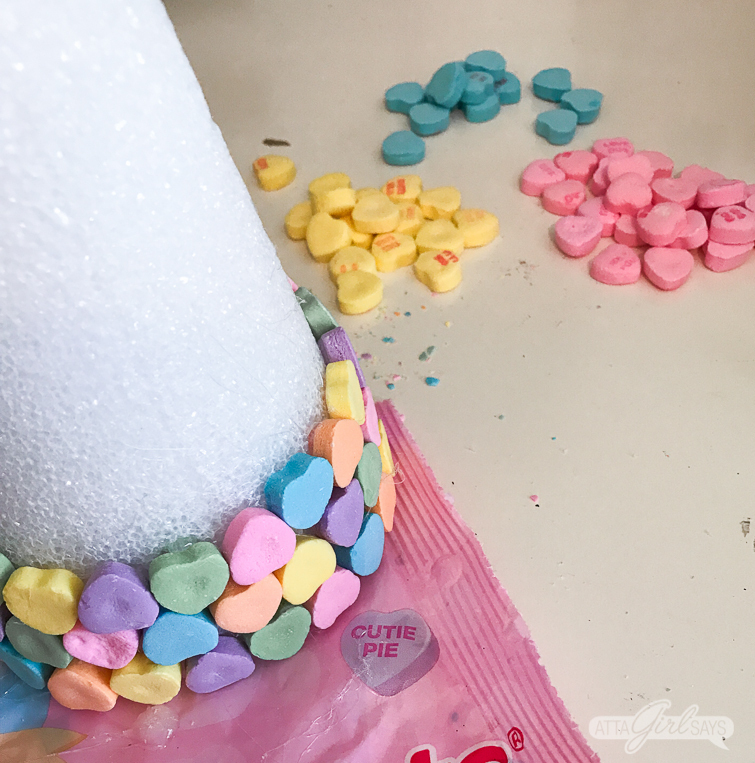 This year, I bought a few bag of Sweethearts and whipped up a cute centerpiece for our table using the Valentine candy hearts. 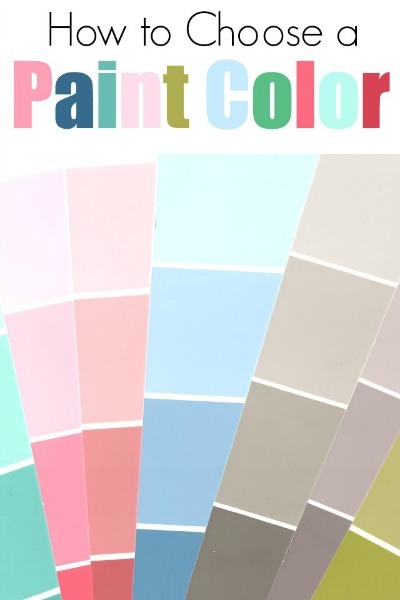 I love all the pastel colors, and the fact that these cones smell like cotton candy! While I am a big fan of the messages on conversation hearts, for this project I opted to showcase the unprinted side of each Valentine candy heart. Let’s just say, quality control isn’t what it once was because the messages were all off center. Or maybe it’s because I bought my Sweethearts at the dollar store. Maybe they get the misprinted seconds! 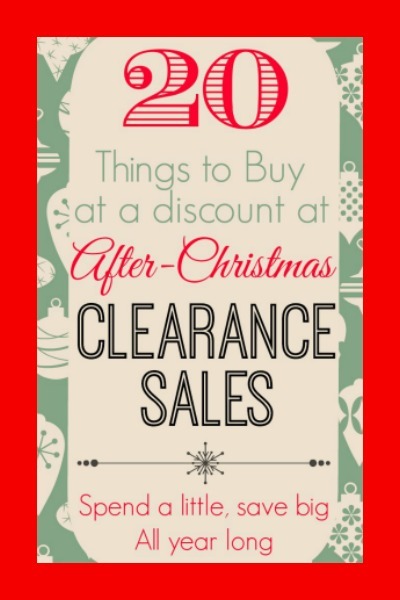 Disclosure: This post contains affiliate links for your shopping convenience. If you make a purchase based on my referral, I earn a small commission at no additional cost to you. 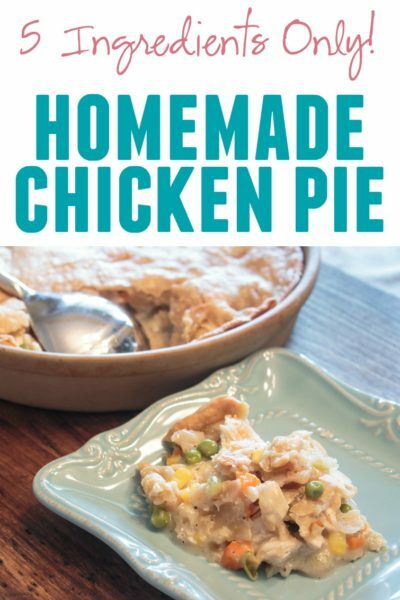 Read my full disclosure policy here. When it comes to eating Valentine candy hearts, I prefer the softer Brach’s Conversation Hearts. But for this project, I used the original Necco Sweethearts because I thought they’d be better for gluing. 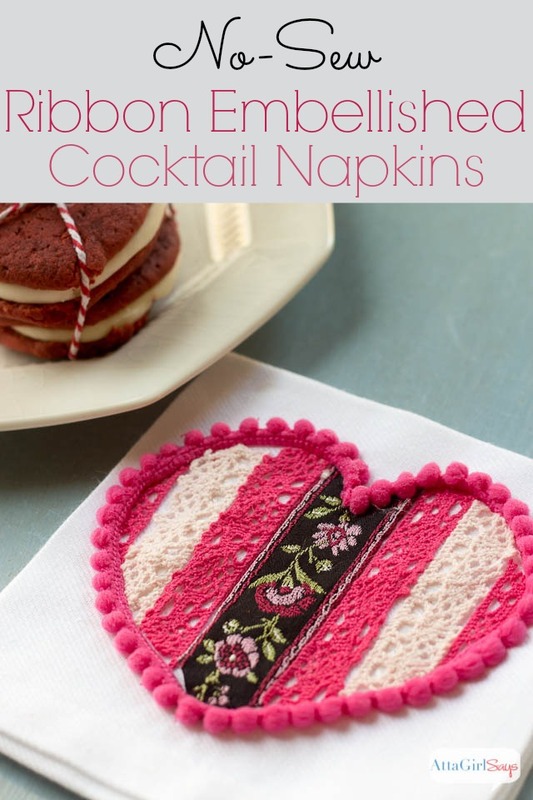 And I knew I wouldn’t be as tempted to nibble on them while I was crafting! 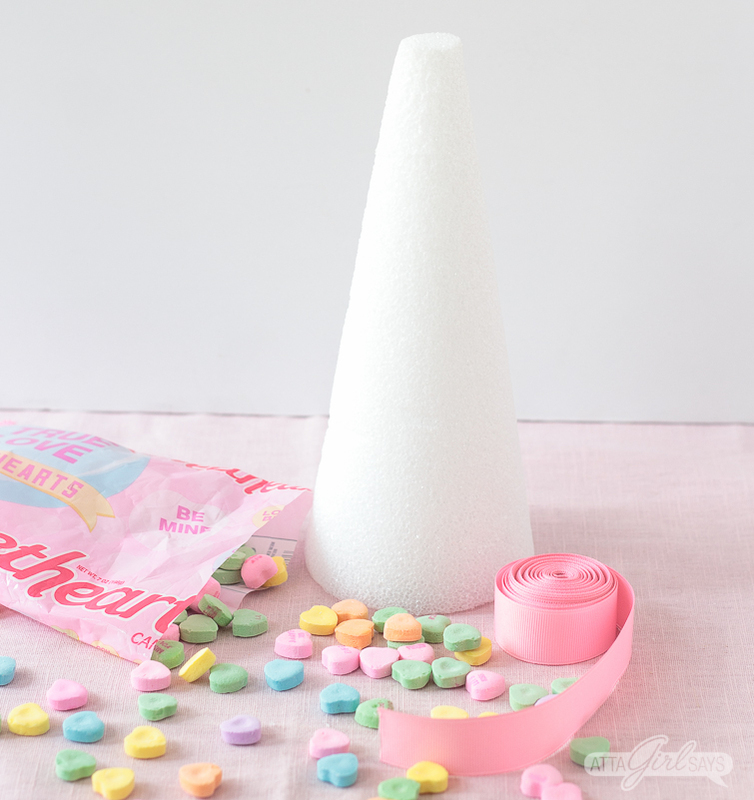 Beginning at the bottom, hot glue conversation heart candies to a foam cone. Alternate the direction of the hearts, point facing down and then up, so they fit close together and hide most of the cone. 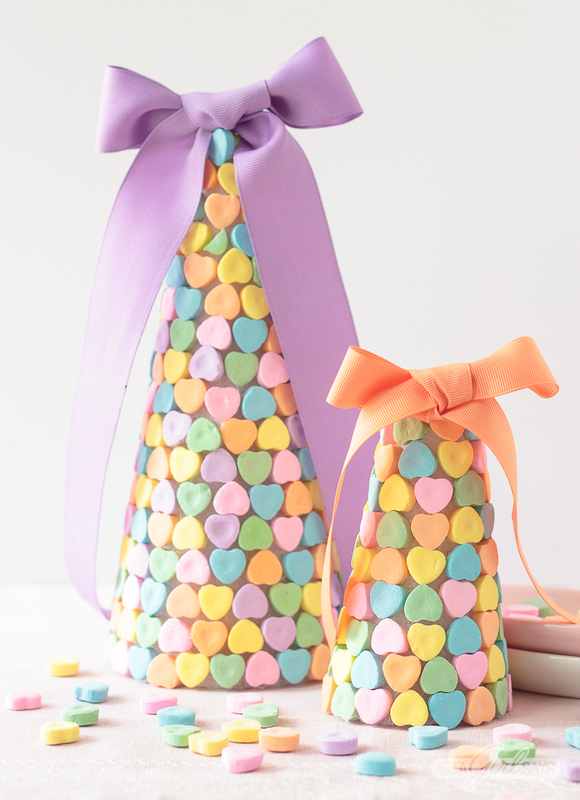 Because I wanted to create a specific color pattern with my conversation hearts, I needed three bags of candies to make these cones. I didn’t use all the candies on the cones, but I found that certain colors – purple and blue, for example – weren’t as abundant as others. 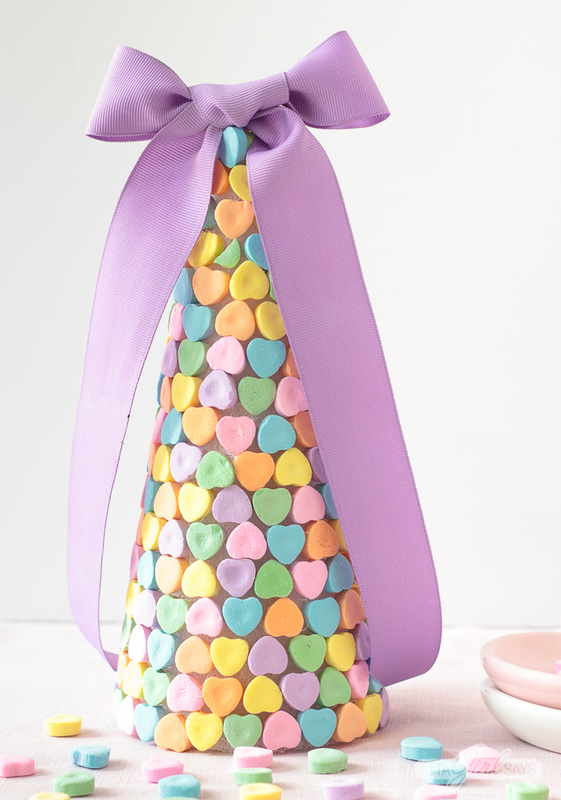 Once the cone is completely covered with hearts, tie a bow using a coordinating color of grosgrain ribbon and hot glue it to the top. Use a hair dryer to blow away any hot glue threads. 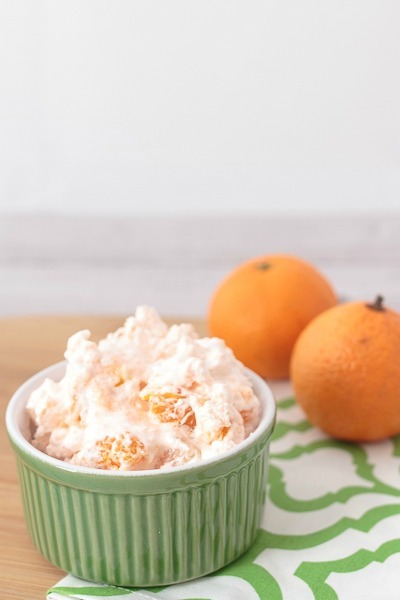 To make cones of different sizes, use a serrated knife to trim the foam, cutting from the bottom. I love using my hot Styro Cutter to trim foam to size. It cuts like butter! 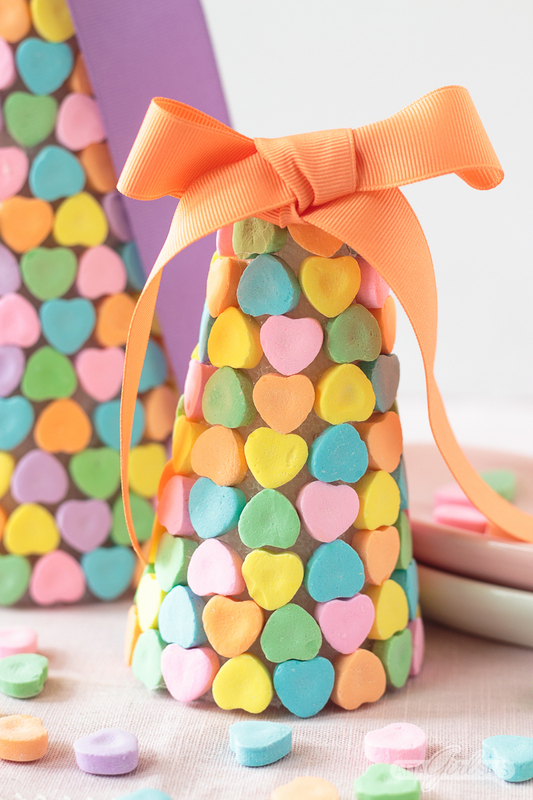 Make sure the bottom is level before gluing on the conversation hearts. 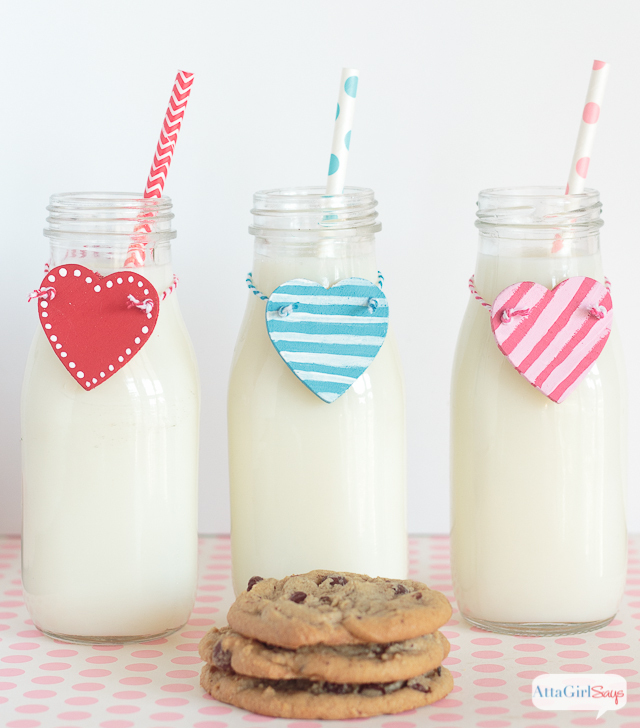 If you want to make this craft with kids, you can try using craft glue instead of hot glue. Just make sure the glue is made to use on Styrofoam. Since craft glue doesn’t set as fast at hot glue, you may have to let each row of hearts dry before adding the next. I don’t recommend keeping these Valentine candy heart cones for next year’s celebrations, as they could attract ants when stored away. 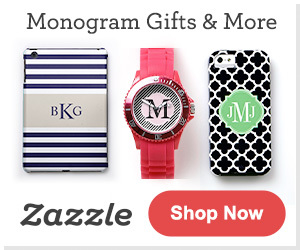 But they’ll be fine sitting on your kitchen table until the 14th. If you want to preserve them, you could try sealing them with a matte spray acrylic. 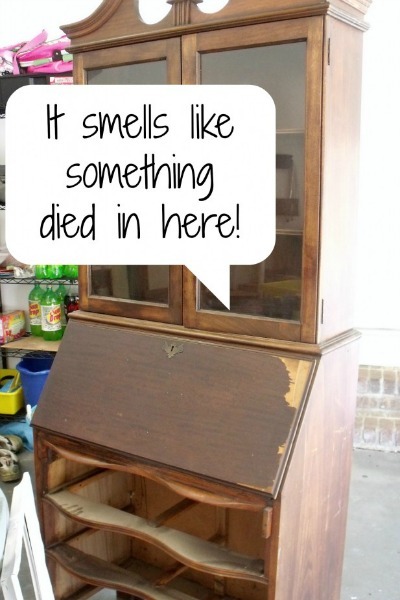 (Be sure the spray sealer you’re using doesn’t dissolve Styrofoam. 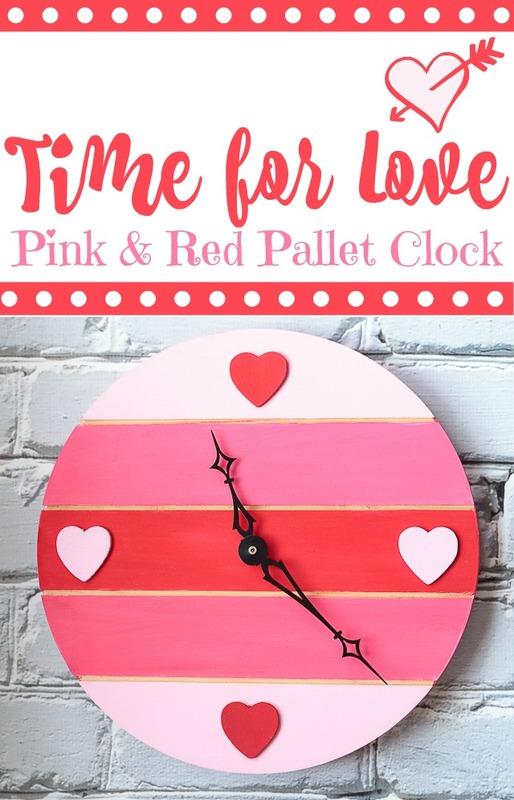 Test the sealer on the Valentine candy hearts, too. I’m not sure how the sugar will react to some aerosols.) Even if you seal them, I would store the centerpieces in an airtight container or plastic zip-top bag.